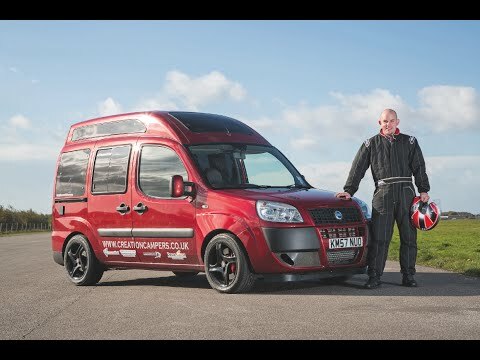 Can the Creation Campers campervan become the world's fastest? As days in the office go, this was a fairly surreal one. Having battled sister magazine Autocar’s Jaguar F-Type R through the ferocious remnants of Hurricane Gonzalo battering the Midlands (we’ll explain why later), we find ourselves standing in the middle of a bleak and violently windswept Elvington Airfield, bewildered by the scenes developing around us. A small group of scruffy vans and covered trailers are busy disgorging a variety of evil-looking, high-powered motorbikes and, oddly, a solitary pink moped. Off to our right, an impressively bearded chap with a ring through his nose is warming through the ancient and scruffy-looking Volkswagen Type 2 bus he’s just reversed off the back of a low-loader. Alongside, a chap in jeans and trainers has just arrived in a suspiciously noisy TVR Chimaera 450 bristling with performance-enhancing nitrous-oxide cylinders. To our left, meanwhile, is what appears to be a giant wheel with an engine and a saddle bolted to it. Closer inspection confirms that this is precisely what it is. The owner/operator informs us that he’s aiming to hit 60mph on it later today. We wish him all the luck he’s clearly going to need, before retreating hurriedly to a safe distance. Finally, we spot an oasis of (relative) sanity and the reason why Practical Motorhome is here. It would usually take rather more than what appears to be a 2007 Fiat Doblo van on sporty wheels to get us up here on a stormy Tuesday morning, but this is no ordinary van. For one thing, it’s a motorhome, not a van. And for another, its owner and creator, Simon Robins of Creation Campers, reckons it’s good for well over 140mph. He’s built it to break the World Motorhome Land Speed Record (currently 138mph). And he’s not going home until he’s done it. We’re here to record what everyone hopes will be a momentous occasion. As the first of the day’s bikes screams through the nearby speed-trap at over 145mph – while pulling a wheelie – we get the inside story on Simon’s little creation. "We bought it as a high-mileage ex-minicab with a blown diesel engine," he explains. "I’d had the idea of building a land speed record motorhome for some time – customers kept asking us when we were going to get around to building a demonstrator, and I wanted something really special to grab people’s attention. When a cheap Fiat Coupé 20v Turbo with a heavily modified engine came up for grabs soon after, I got to wondering if its engine would fit in the Doblo." It turned out that it would, but only with a lot of persuading and even more custom-fabrication of one-off engine mounts. "At one point, I really didn’t think the engine was going to fit," says Simon. "But we got there in the end." The Fiat Coupé Turbo’s standard engine is hardly underpowered, but a previous owner had uprated this one with a GT28 turbo and an upgraded intercooler. With further fettling by Simon, including a major engine management remap courtesy of Bristol-based FC Performance, the little Doblo was duly dyno-tested at over 337bhp and 306lb ft of torque. Factor in a race clutch, the donor Coupé’s five-speed gearbox and suspension (stiffened and lowered by 60mm), an almost totally flat underfloor and racing brake pads and discs, the über-Doblo was finally ready for the track. But why a Fiat Doblo? Simon’s wife, Gemma, takes up the story. "We’ve always specialised in building micro-campers, and the Doblo seems to be a very popular base vehicle at the moment. We must have converted upwards of 25 Doblos to campers, so this seemed an obvious way of keeping the project in line with our business. "We originally started off with an older low-roof car," she continues, "which Simon preferred because of its lower drag, but I knew we had to build something that was a practical campervan as well as a speed machine. So we went with this later high-roof model instead." "We’ve deliberately kept all the mechanics Fiat and left it looking as standard as possible," adds Simon. "We might have got more grip and downforce if we’d fitted big wings and spoilers, but that would have defeated the point of the exercise. We wanted to show that you can build something special that doesn’t have to cost millions of pounds." For all of its high-performance record-breaking potential, the Doblo is also a fully functional micro-camper, with a spacious lounge area, small kitchen, fitted loo and 230v electrics. There’s even a special roof lining inlaid with LED ‘stars’ to lift the interior further. Having decided against mentioning that this is the very place where Top Gear presenter Richard Hammond had his near-fatal rocket-car crash a few years ago, we step back and allow Simon to complete his final checks. Which seems a good time to explain why we’ve come to Elvington, not in our usual poverty-spec VW Golf diesel pool car, but a Jaguar F-Type R coupé packing a supercharged 5.0-litre V8 engine good for 542bhp, 0-60mph in a smidgeon over four seconds and a top speed of 186mph. Other than giving its lucky driver (me) considerable bragging rights on Facebook for a couple of days, there was method in our madness. 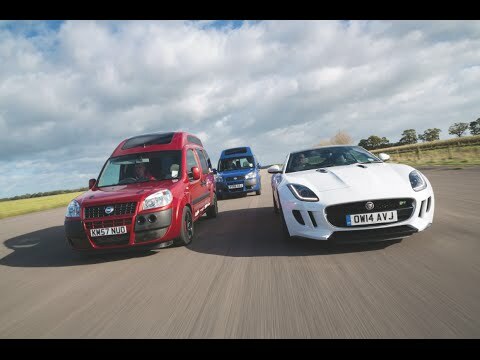 For obvious reasons, the plan was never to pitch the Jaguar directly up against Creation’s land speed record contender, but to put the little Doblo’s performance into some sort of perspective. It may have three fewer cylinders than the F-Type, but with the more than achievable tweaks Simon has planned for the Doblo next year, it will be a relatively scant 140bhp short on power, despite weighing considerably less than the 1650kg Jaguar. To put that into sharper focus, Simon’s creation comfortably out-points the 335bhp punched out by the F-Type V8’s supercharged V6 sibling and isn’t far off its quoted torque figure. In short, this is one seriously well-endowed little campervan. But despite it all, the Doblo’s chances aren’t looking good early on in the day. In order to beat the existing record, Simon must complete two runs in opposite directions within a window of just one hour. And while the mile-long run with the wind at the Doblo’s rear should pose no problems, the run into the headwind (which seems to be getting stronger and gustier with every passing minute) is shorter, meaning the chances of getting up to a high speed are lower. Worse, it’s looking like the run-up to the main drag isn’t going to be long enough. Undeterred, Simon guns the little Doblo hard down the track to the start line at the far end. The specially fabricated central exhaust (so mounted to maintain a smooth and balanced underfloor surface) barks, pops and bangs as Simon flicks through the gears and he’s soon lost from sight. Minutes pass. Then one of the superbikes screams past, riding on a wave of buffeting tail-wind, followed a minute or two later by another. Then the assembled spectators spot something much bigger coming into view over the horizon. A flurry of camera lenses rise as one and focus on the fast-growing smudge as it approaches. Someone mutters that it’s not looking particularly fast and, hearts sinking, we have to agree. Has the Doblo developed a problem already? Then the smudge becomes a shape, and we realise that it’s not the Doblo, but the rat-look VW Type 2 we spotted earlier. No-one spares it a second glance as it wuffles through the speed trap – all eyes are back on the horizon. The Doblo finally appears, and it looks like it’s really motoring. It looks stable on its heavily modified suspension and howls through the speed trap at an impressive lick. Given that Simon had said earlier that he’d go easy on the first run, this bodes well. Come the second run, the timing ticket reads an incredible 142.4mph – well above the 138mph target speed. Encouragingly, the wind seems to drop marginally as Simon lines up for his next run, but disaster strikes as the Doblo accelerates hard past 120mph – a startled bird flits across his path, forcing him to lift off the power. The run is eventually recorded at a lowly 59.7mph. After a short break to recover, Simon heads back out for another run. The wind continues to howl around the expectant little group huddled near the speed trap and seems to grow in strength. Endless minutes pass. A motorbike shrieks past us, then … nothing. Another bike hurtles past five minutes later, then another, followed by the TVR bellowing its way through the timing trap. We’re sure all left the pit area after Simon, so where is he? At last, the Doblo comes into view, and Simon’s clearly really on it. The timing ticket reads 143.7mph – he’s heading in the right direction. More runs come and go, some higher than others. The tension is awful. Then, after Simon’s final run of the day, Straightliners gives us the news we’ve been waiting for – with a final average run of 141.3mph, Creation has the motorhome land speed record. It’s been a long, cold and tiring day of seemingly endless hanging around punctuated by the odd stab of excitement, but Team Creation has achieved what it came to Elvington for. Gemma and Simon are elated, but temper their joy with a touch of rueful regret. "If the wind hadn’t been so strong all day, we would have obliterated the record, rather than just broken it," Simon reckons. As the Type 2 is loaded back onto its truck, bikes are returned to their trailers and the bizarre motorised wheel heads for home (we never did find out if he managed his 60mph target speed), Simon is making plans for his next run. "I want more power for next year," he says. "I reckon a new camshaft, gas-flowed head and a spikier remap will get us closer to 400bhp." Pendine Sands is broached as a possible venue, but for now, it’s time to celebrate a remarkable achievement. Ladies and gentlemen, we give you Creation Campers’ Fiat Doblo 20v Turbo micro-camper: officially the world’s fastest motorhome. This handy app helps you find a campsite or motorhome pitch!